Not many customers are aware that Shelters Direct provides two separate material options for our pre-fabricated buildings. Buildings, also known as guard booths, are much different than shelters. These booths are permanent, fully enclosed structures designed with a functioning door and anchored to a concrete pad. The two design materials utilized for guard booths is carbon steel and aluminum. These two materials are very different from one another, so how do you determine what material is best suited for your facility? Since Shelters Direct has supplied various guard booths throughout the nation, our team can assist you with determining the best building material for your site. As an organization, we supply and install more steel guard booths than aluminum, but that doesn’t mean we don’t see our fair share of aluminum buildings. Sometimes specs will be adamant about the building material needed for a project, so it’s important to understand why these two materials are so different. Below, we feature the differences between steel guard booths and aluminum guard booths. Steel buildings are much heavier than aluminum buildings, but that does not mean they are not susceptible to corrosion. If your facility is situated right on the ocean, Shelters Direct highly recommends that you purchase an aluminum building. The salty air can corrode steel, making the lifespan of your building much shorter. This is specific to coastlines because in most cases steel will usually last longer than aluminum. If your location is not directly on the water, steel is usually the better option. 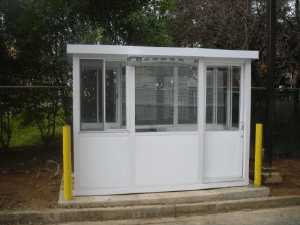 Shelters Direct provides guard booths for various purposes such as parking attendant stations, access control points, toll booths, and gas station kiosks. The end-usage of your building could determine what building material you need to purchase. For instance, if your guard booth needs to be bullet resistant, you need to purchase a steel booth because aluminum is not strong enough to hold the extra steel plating and thickness of bullet resistant glass. If you need a guard booth for a fueling station, the safest material to purchase is steel because aluminum is a combustible material. If you’re confused about what material is best suited for your application, the Shelters team can assist you with this process. Since Shelters Direct can ship our buildings anywhere in the United States to any type of facility, it’s important to be aware of travel considerations, how each booth is made, and how this will affect your cost. 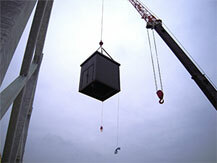 Our steel buildings are always welded, but only one of our aluminum guard booth options is welded together. The two types of aluminum booths we offer are a mechanically fastened aluminum booth and a welded tubular aluminum booth, but these are not always your best option in terms of travel and cost. A pre-fabricated building held together with metal fasteners and strapped onto a tractor trailer for an extended amount of time can be potentially harmful and welded aluminum buildings are a more expensive option. We usually recommend steel if a guard booth will be traveling a long way. The differences between an aluminum building and a steel building can sometimes be confusing, especially if you don’t have a spec and you aren’t certain what your facility needs. Rest assured that the Shelters Team can walk you through the entire process to ensure that you are getting the best possible structure for your facility. We are a leader in the Guard Booth industry not only because we have supplied and installed guard booths nationwide since 1993, but also because our booths, aluminum or steel, are always insulated. This is not a common feature for most aluminum guard booths, and you can’t usually find a manufacturer that will supply you with an insulated aluminum building as a standard feature. Aluminum or steel, our promise to you is that your employees will always be comfortable in a Shelters Direct guard booth. Please contact us if you have any questions. Shelters Direct has been a trusted source for the supplying and installation of booths, canopies, shelters, and prefabricated guard booths for over 20 years. We work with a wide variety of clients throughout the United States and abroad to provide quality products and expert installation so you can be confident that we will get the job done right. Interested in learning more about how a pre-engineered canopy could benefit your business? Contact us today! And don’t forget to keep up with us on Facebook, Twitter, Google+, and LinkedIn too. This entry was posted on Monday, November 21st, 2016	at 4:09 pm	. You can follow any responses to this entry through the RSS 2.0	feed. Both comments and pings are currently closed.